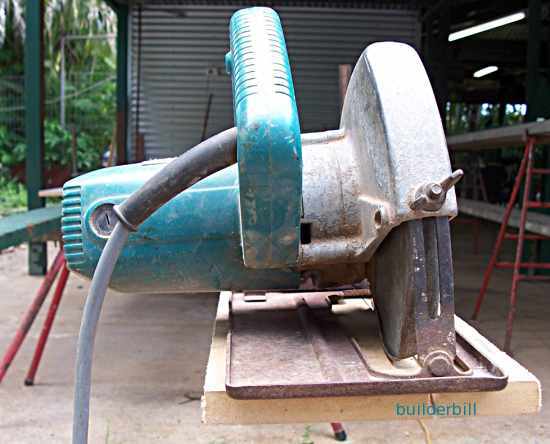 Any one of a few different types powered saws, but in particular a common term for a hand held electric saw with a circular blade used for cutting wood. 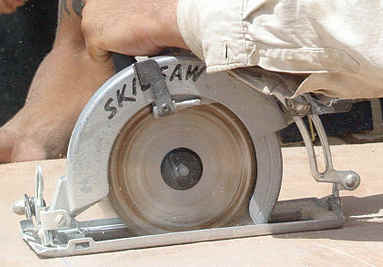 In the US a term used for a hand held saw that has the blade fixed directly to the electric motor shaft. Also known as a Worm Drive Saw. 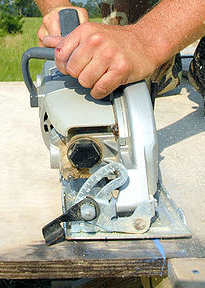 A hand held powered saw that has the blade at right angles to the main shaft of the electric motor. 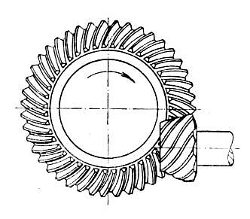 The power is transferred through Hypoid gears. In spite of the fact that the saw below looks antiquated and should be on the scrap heap after many years of hard work (tell me about it :-) it will be good enough to illustrate what a sidewinder type of saw is. It is fitted with a TCT blade that is used for general cross-cutting. The small saw is just about half the weight of the larger one, and it can still cut through 50mm. This is why when I got older and wiser I used this size of saw, one handed, for work on scaffolding, ladders and planks for jobs like sawing off rafter ends. It cuts well if it is sharp and with one hand use it leaves one hand free to steady myself. In many cases "bigger is not better"
These saws particularly in the 225mm size can give quite a kickback if they jam, so they are mostly held with both hands. Base height adjustment for depth of cut. The base of all of these power saws can be adjusted to control the depth of cut. At the front is a pivot point and at the rear is a wing-nut which grips on a curved slide. By lifting the base up and down the depth of the blade showing can be measured. Here is one of my smaller saws and below is a shot of another saw set-up in a similar way. It is cutting through a 20mm piece of material. 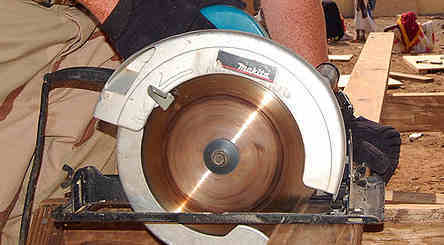 For best running I recommend that the the saw blade should cut through and have about 10 or 15mm showing below the cut. So at the back of the baseplate there is the curved support that allows for depth of cut adjustment. At the front of the base is another curved support that allows the angle that the blade makes with the blade to be adjusted. The saw shown here all all set to making square or right angle cuts, but it is possible with all these saws to cut at least 45 degrees and sometimes up to 50 degrees. The photo above does not show the angle adjustment at the front really well, but look at the last photo below on the right and you will see it clearly. One of the most important items on these power saws is the blade guard. It is spring loaded and it should always return to closed as soon as it is taken away from the work. It is common to give it a few flicks with the handle before the machine is used for the first time to check that it is running freely. 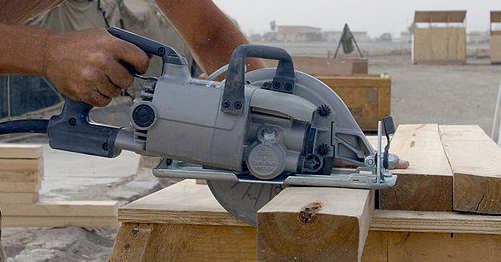 In the photo above the saw is just being started in the cut and the blade guard is pushing against the edge of the work. As the saw advances it will move upwards. Above is a photo of a Hypoid Saw. It is claimed that they are more convenient and easy to use than the sidewinder and that they deliver more power. In the photo you can see that the grip is behind the saw and all the thrust is in the direction of the cut. With a sidewinder the grip is more above the saw with part of the thrust being downwards. 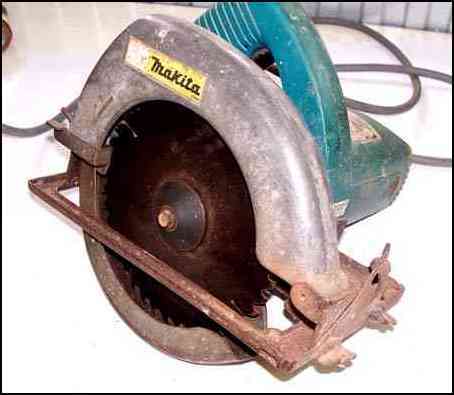 I used to own a Makita Hypoid for about a year I guess until it got stolen off a work site. In the time I owned it, it got plenty of work and I would say that for working on a bench sawing up sheets of ply etc. it was very good, did an excellent job. For working on a roof, sawing roof battens and rafters I found that the handle was too far back and it was just a lot harder to use single handed. When to saw got stolen I didn't bother to replace it. Hypoid Bevel Gears are made on a curved line and they mesh over a longer distance giving a stronger joining surface than a straight gear. This leads to longer life. At the right is the front view and as mentioned earlier it clearly shows the wing nut and curved support for altering the base/blade angle.